To rally fans, 'Dakar' means 'Hard'. Fortunately, the Land Cruiser likes a challenge, and consequently, the famously reliable 4x4 has a long history of success in the gruelling 15-day, 5,280 mile desert race. In 1996, Team Araco entered two Land Cruisers and took the top two podium positions in their class (Unmodified Diesel). Five years later in 2001, the car celebrated its 50th anniversary and Araco successfully toasted the car's half century by winning the class championship once more. 2005 was the first year that the car competed as Team Land Cruiser Toyota Auto Body, as opposed to Araco. Another first for 2005 was the rankings of the three Land Cruisers that Auto Body entered; each occupied the podium positions in the unmodified production group. In 2014 a pair of 200 Series Land Cruisers took the top two positions in the production car category of the Dakar. Number 345, driven by Jun Mitsuhashi and co-piloted by Alain Guehennc took the overall category win, followed by Nicolas Gibon and Akira Miura in the number 344 car. Between 2006 and 2013, husband and wife explorers Paul and Brigitta Bohlen Juni, from Switzerland, circumnavigated the globe in a 70 Series Land Cruiser, visiting 63 countries and clocking-up a staggering 174,000 miles. Midway through their trip, the couple sent a letter to Toyota Europe, in which they wrote: "The Land Cruiser is the best car you can drive around the world." If you thought that no one could top Paul and Brigitta for Land Cruiser-based tenacity, then you'd be wrong. Enter Emil and Liliana Schmid, who have earned their place in the Guiness Book of Records, having spent almost 30 years travelling the world non-stop. As of 16 July 2014, the couple had covered 430,130 miles since 18 October 1984 - in the same 60 Series Land Cruiser. The couple have visited 180 countries and territories, and have no permanent address - theirs is truly a life lived out on the open road. 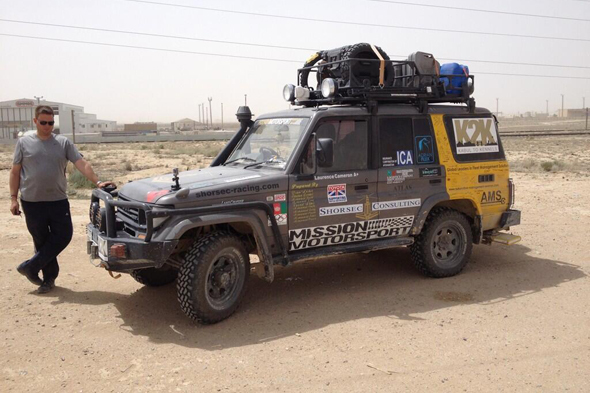 In 2013, father and son Graham and Ed Durgan covered 12,000 miles in their 100 series Land Cruiser. The pair's adventure began in Littlewick Green in Berkshire and finished in McGill University in Montreal, Canada, where Ed had been offered a place to study political science. Billed as 'The longest school run', the trek saw the pair take in 40 cities in 14 countries, including Russia, Kazakhstan, Mongolia and China, before boarding a cargo ship and continuing their drive across the United States and into Canada. Despite the distance, the pair only suffered one flat tyre, and reached Montreal in August 2013. Barely a year goes by without someone undertaking a marathon drive in a Land Cruiser – and 2014 was no exception. In April, ex-marine Chris Short, pal Domenic Senger-Schenk and filmmaker Laurence Cameron travelled 4,600 miles from Afganistan to Goodwood, West Sussex, to raise money for Mission Motorsport, a charity that helps in the recovery and rehabilitation of ex-service personnel through motor racing. Chris completed his journey on a motorbike, with Senger-Schenk at the wheel of the Land Cruiser. The three men finished at midday on 27 June after crossing 17 countries, arriving at Goodwood in time for the Festival of Speed. On the Goodwood Toyota stand, Chris said: "I'm very happy, very tired and really looking forward to a cup of tea." He added, "It was hard... in fact, it was really hard – but that's exactly what it was meant to be." The team raised over £22,000. The Land Cruiser Story How do you sum up in one word a car that has achieved the status of legend the world over – durable, rugged, reliable, unbreakable? The Land Cruiser is all of these and more. Capturing the Peaks of Europe On the road with Toyota 4x4 Ambassador @lebackpacker Meet our new Toyota 4x4 Ambassador Toyota hits the road with adventure photographer @lebackpacker Toyota's Journey to Dakar 2017 Dakar’s back for its eighth successive year in South America, join the action and follow the Toyota teams' progress. Toyota make the podium at Dakar 2016 Relive the mud, sweat and cheers of Dakar 2016 as two Toyota teams raced towards the podium, finishing 3rd and 5th. Toyota's Journey to Dakar 2016 Dakar’s back for its eighth successive year in South America, join the action and follow the Toyota teams' progress. Toyota Genuine Motor Oil In the same way that we need water to function, or plants need sunlight to bloom, your car’s engine needs the protection of motor oil to survive and continue to perform at its best. The Celica Story With a name that means ‘Celestial’ or ‘Heavenly’ in Spanish, the minute the Celica turned a wheel it was destined to be a star; no-one realised it would go on to shine brightly for 35 years, span seven generations and, for many people, become a car that was truly out of this world.